Punk was a music style which came into being since the early sixties. The music was welcomed by the young people. After nearly fifty years, there are still a very large amount of people who keep following this style. So a few tips below will help you be punk. Very first of all, you should adopt the attitude that most punk share. A punk attitude is one that includes a devil-may-care stance, rebellion and lots of sneering. You must also defy authority at every turn, even if you happen to agree with them. Dress up in punk style. 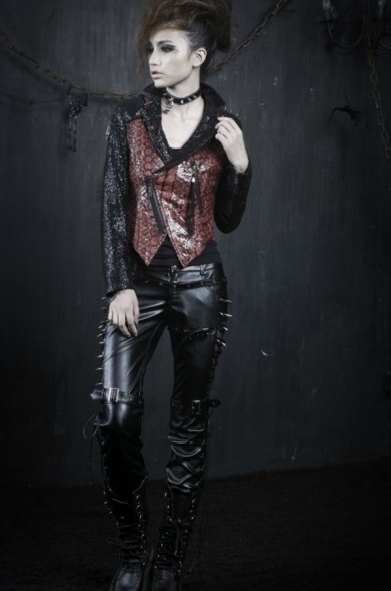 Punk fashion is one with the features of messy, thrown together and full of holes. Plaid is a big, as is broken-in leather, ripped up T-shirts and manly tank tops. A prime outfit may include an old tank ripped at the straps and tied back together with wire or shoe laces, a plaid miniskirt and a leather vest that has scrape marks where its previous owner was dragged beneath a freight train. Be completed with additional accessories. Random tattoos, piercings with things like giant safety pins and lots of black rubber jangly bracelets help cement the look. You are also going to want to invest in plenty of fishnet stockings, a few pairs of combat boots and heavy chains to dangle everywhere from your back pocket to your nose piercing. With all tips provided above, you will look definitely a awesome punk.